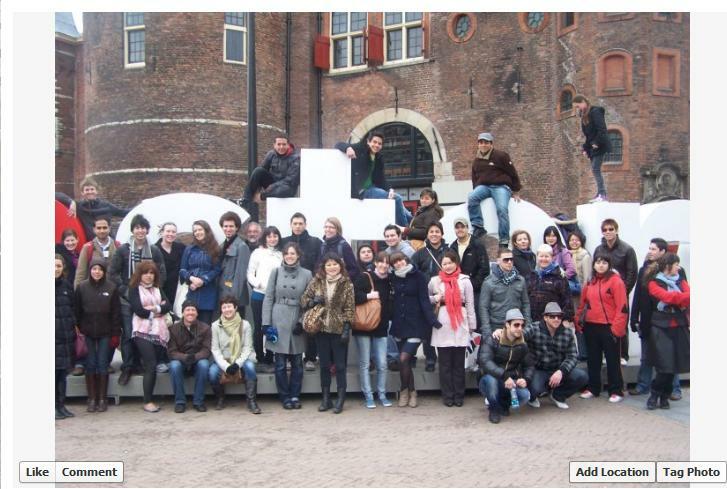 Me and my friends in a tour group in Amsterdam. You meet that hot rocker guy/girl at that concert you really like, and you guys trade names. You say, “Find me on Facebook”, and the next day or so, he/she adds you. You talk about wishing you were closer to the stage, the length of the concession lines, and why on Earth the T-shirt prices are so expensive. Typically, the conversation blossoms into a beautifully uninteresting synopsis of your daily routine: how tired you are despite normal hours of sleep, what YouTube links you think they’ll absolutely enjoy watching (because you do), and figuring out ways to make money without actually having a job. The chatter dwindles to a few comments or posts on one’s wall, then a “like”, and finally you’re down to that yearly “Happy Birthday (insert name here)” because you know they know its their birthday, and you don’t want to be that one guy/girl who doesn’t say anything. Why do we do this? Why don’t we talk to our friends anymore, and why have they forgotten us? Weren’t our YouTube links interesting? In the social media powerhouse we know as Facebook, I use the term “friend” lightly. Discussed by David McRaney in his blog, You Are Not So Smart, acquiring hundreds of friends on Facebook becomes a zero sum numbers game, with 150 as its approximate cap. You will typically be able to maintain a personal relationship with 150 people at any given time. The seemingly magical amount is the Dunbar number, developed by Robin Dunbar, a renowned anthropologist who correlated the size of the brain with the amount of potential social connections within a group. Even at this physiological limit, you’ll actively (on a daily or semi daily basis) talk to about 20. This doesn’t mean you’re a bad friend. You just have a limited neocortex. This cranial region takes into account social nuances and personal relationships. As your circle of friends increases, your maintenance of existing friendships increases several fold. Also, friends that have left your circle (be it geographic separation or interpersonal reasons) are harder to keep in contact with, as they require a portion of your processing power to keep the connection. The average person has 130 friends on Facebook (close to the Dunbar number), but there are people out there with +2,000. Do they talk to every single person they’ve ever friended? Of course not. It’s nearly impossible to do so with every other aspect of our lives screaming for attention. That’s not to say our social network isn’t a good thing. Facebook, Twitter, LinkedIn, and numerous other platforms for social networking are making communication easier than ever. We can have a great many loose connections to people, through our fascination with franchise coffeehouses, the latest Rube Goldberg contraption, or even that band that you like so much. 1 out of every 13 people on Earth is playing this never-ending game to increase their “friend stock”. Take solace in the fact that regardless of the number of Facebook friends we acquire, biologically, we’re basically average.